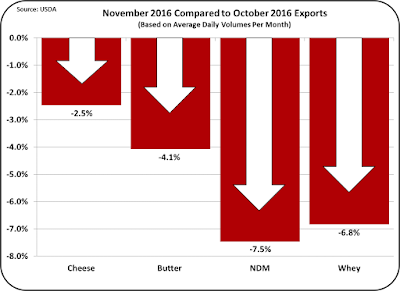 November exports of dairy products that influence producer milk prices were down compared to the prior month and imports were generally up. 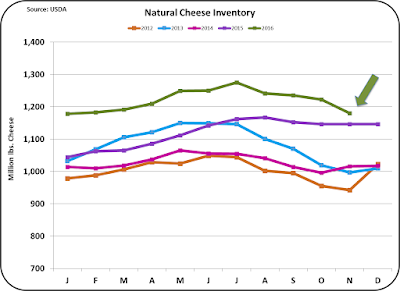 While prices are improving internationally, increased volumes are proving difficult. 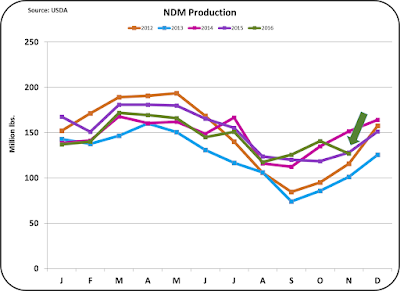 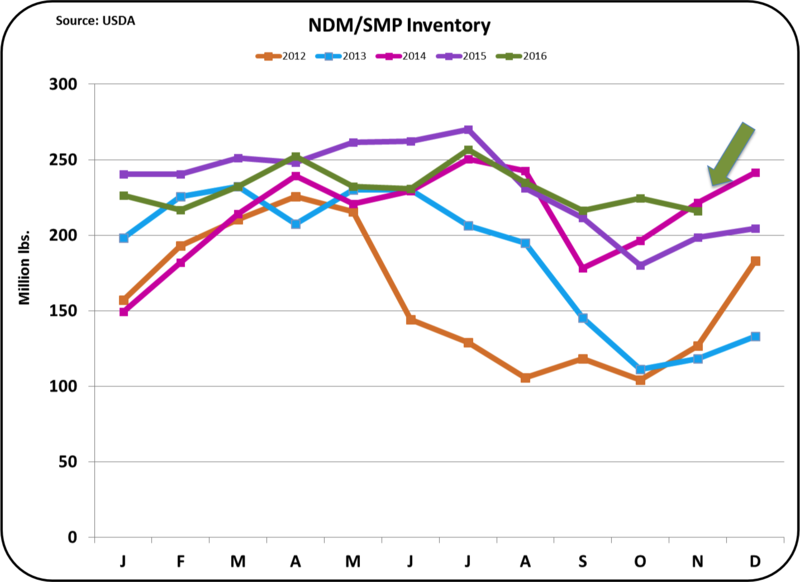 NDM was again a bright spot in the statistics. 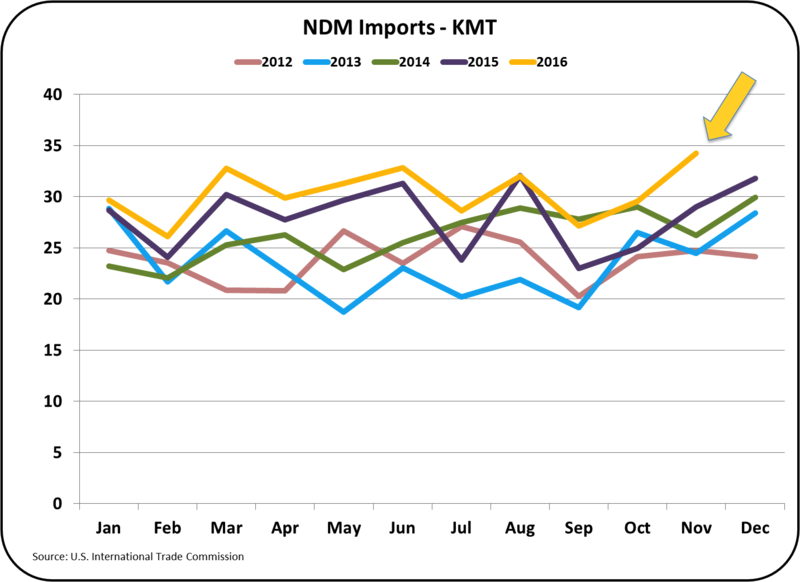 The biggest change was in NDM, the largest U.S. export item in volume. 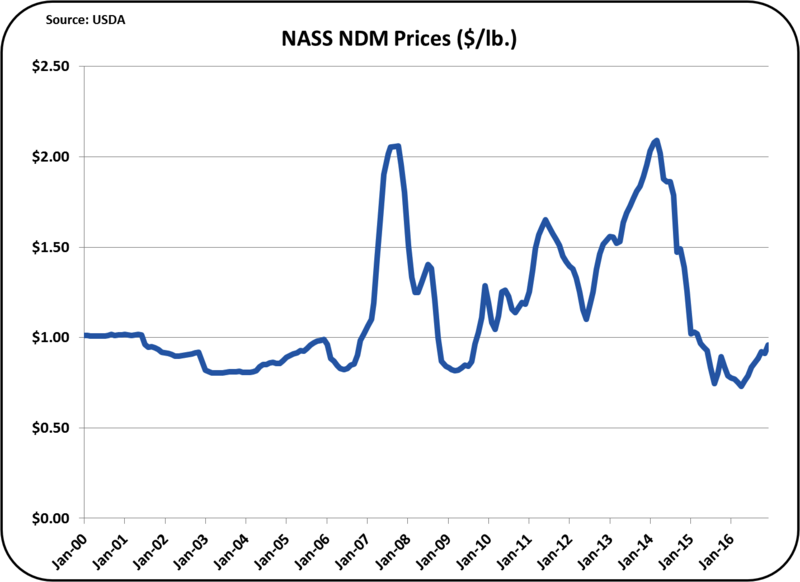 As mentioned above, NDM was down from the prior month, and it was well below the all time volume highs that occurred in 2014 and 2015. 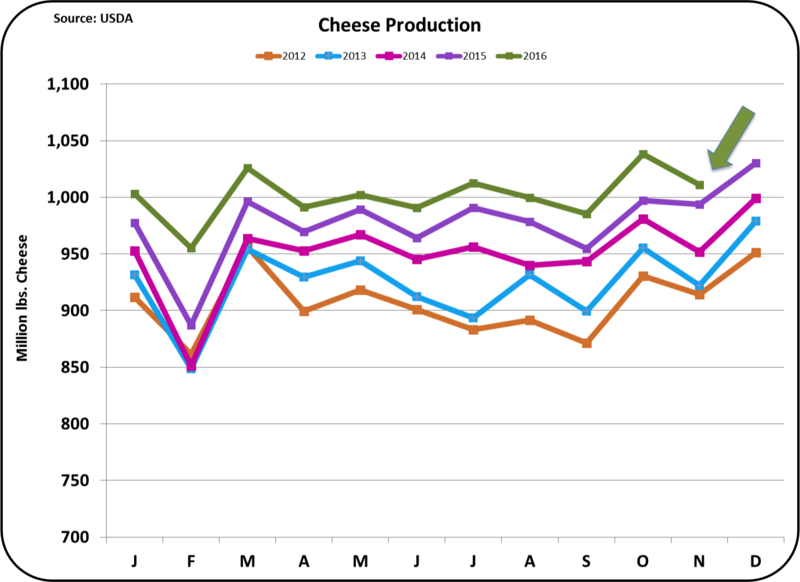 However, it was still the second best volume level of 2016. 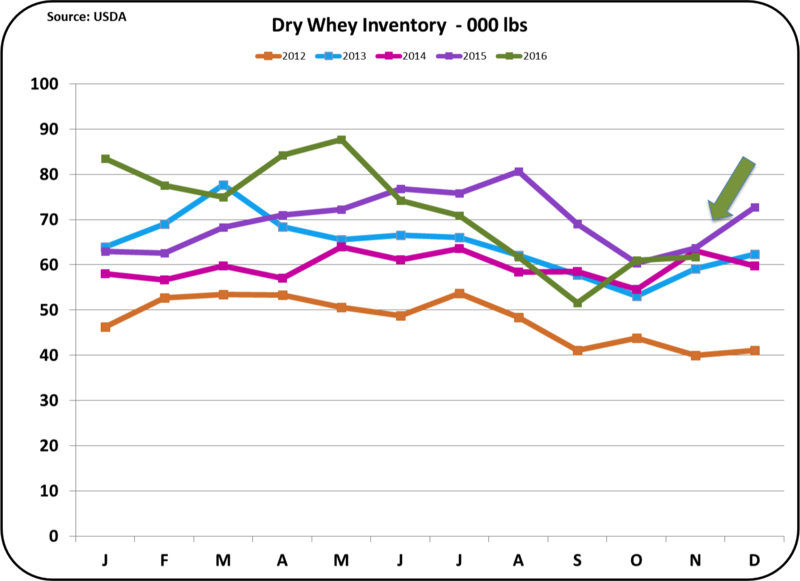 While export volumes are encouraging, prices are still 50% below early 2014 levels. 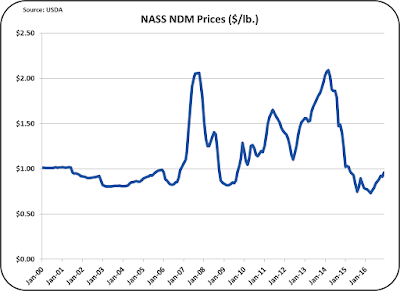 Unfortunately, imports of NDM were also up to record levels. 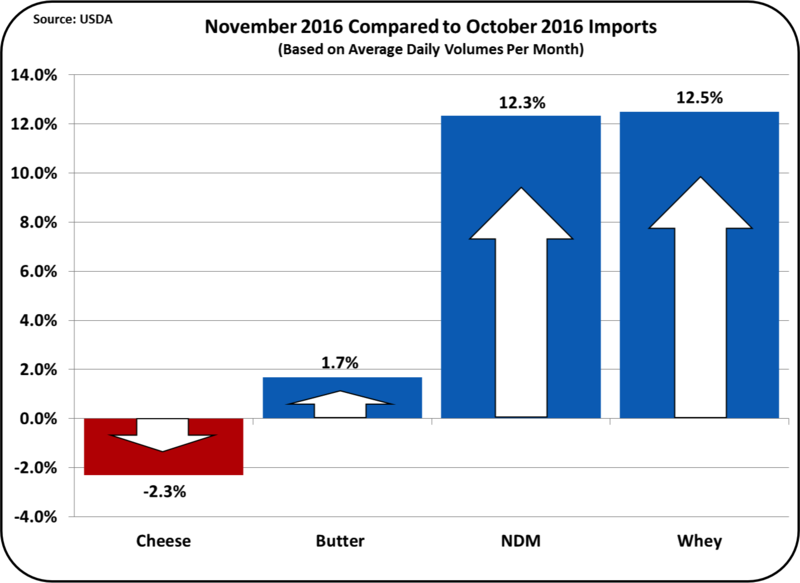 This was an all time high record for imports. 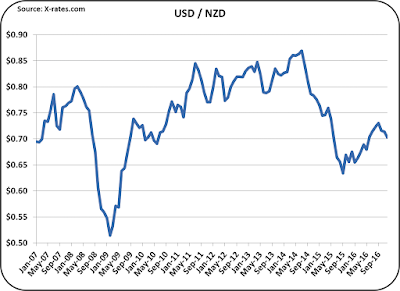 The two largest sources of imports were Canada and New Zealand. 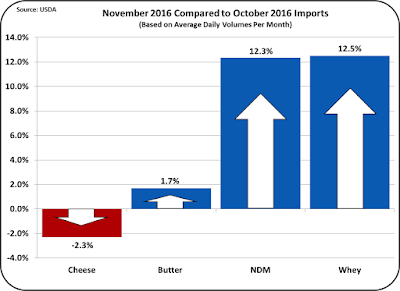 Much smaller amounts were imported from many other countries and those imports were up substantially from the prior year. 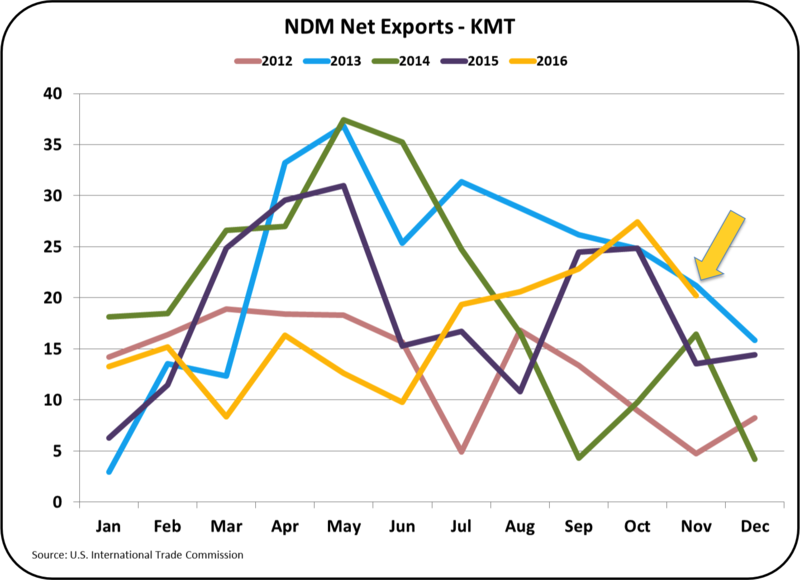 As a result, the net export volumes were down significantly from the prior month and were well below the peaks of 2013, 2014, and 2015. 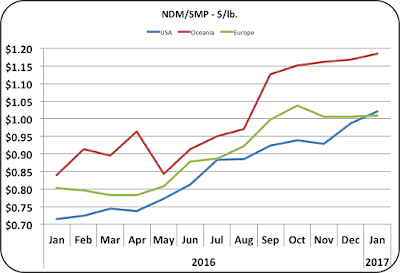 The chart below shows the comparative prices of NDM/SMP on the international markets. 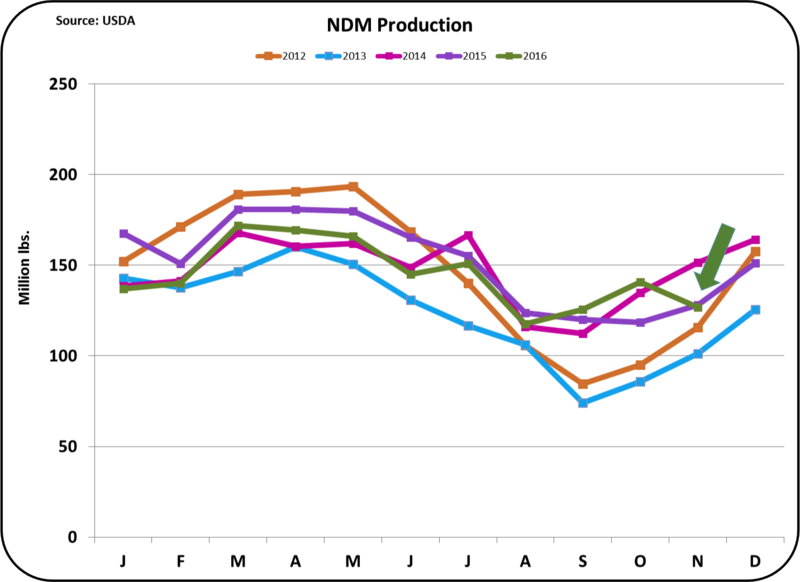 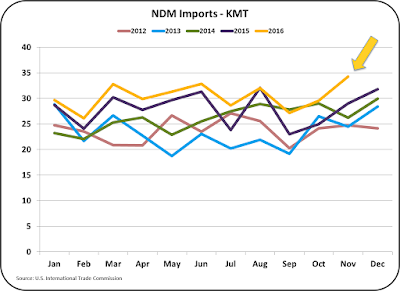 For all of 2016, prices for U.S. NDM were below SMP prices from Europe and New Zealand. 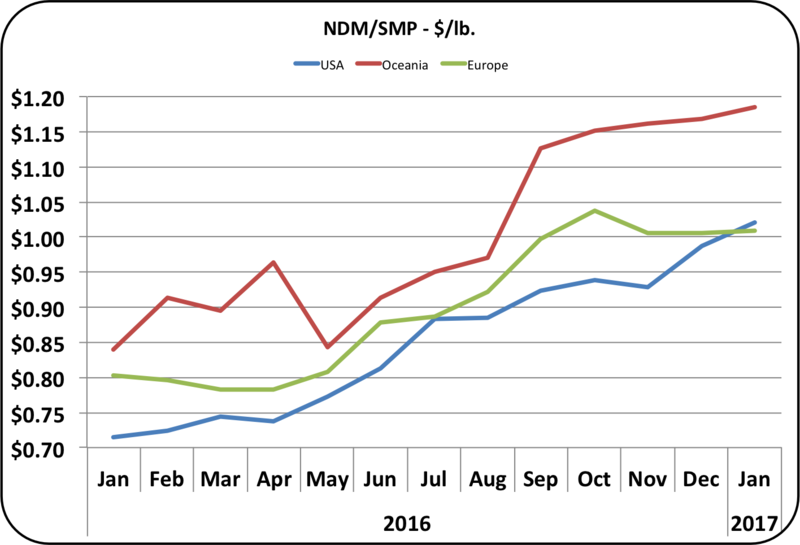 However, in January, the U.S. price rose above the price of SMP from Europe. 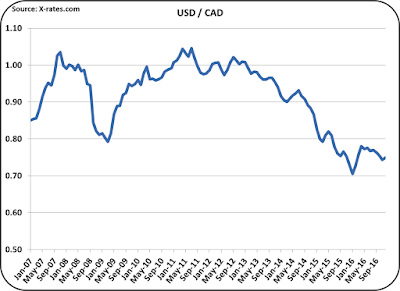 This was likely the impact of exchange rates which are reviewed below. 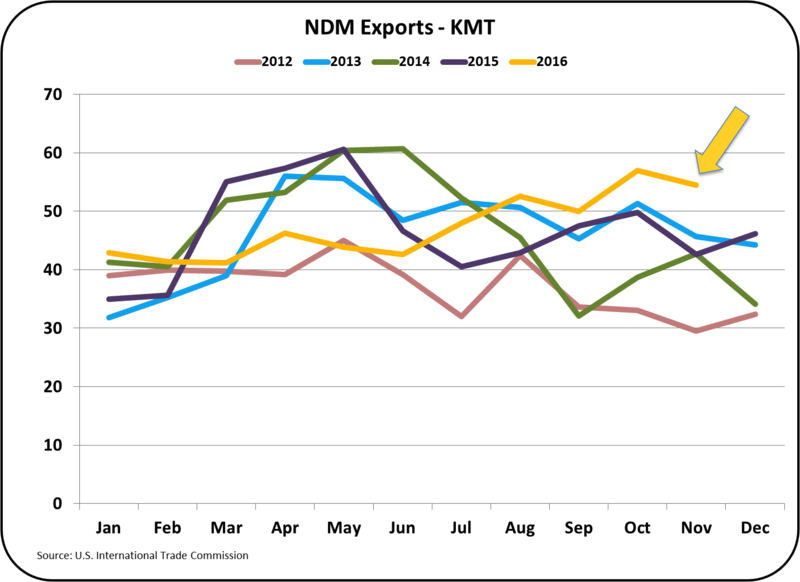 The stronger USD may impact December and 2017 exports of NDM. 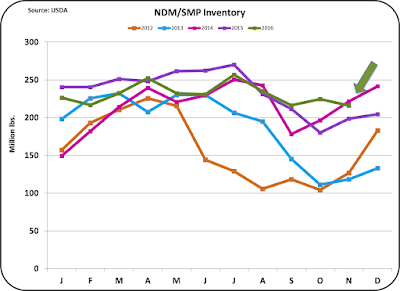 For a review of the difference between NDM and SMP, see the December 18 post. 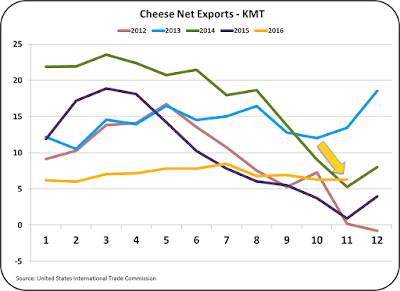 Cheese and butter net exports remained near the YTD 2016 levels. 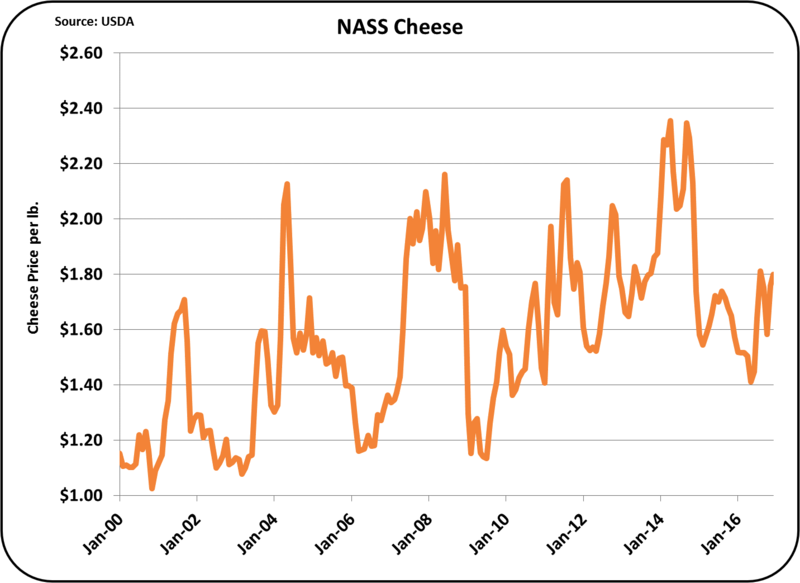 Cheese prices have risen globally, but U.S. cheese is still higher priced than the competition. 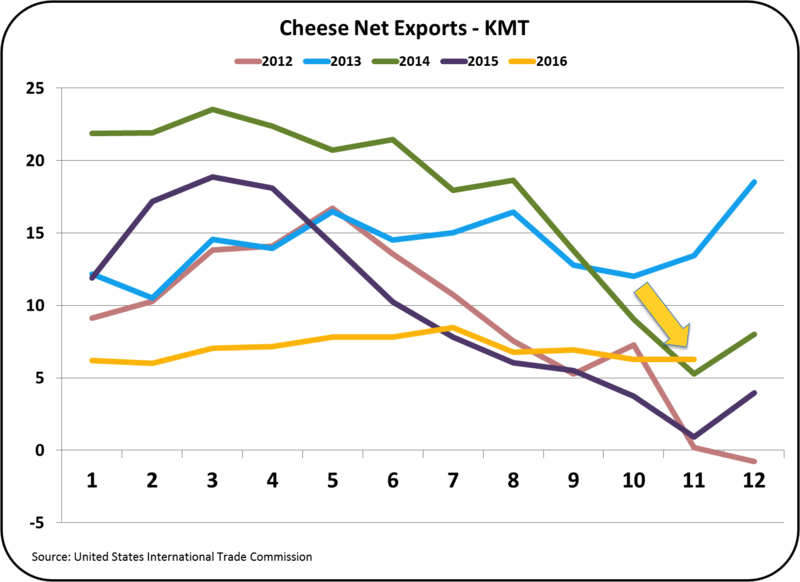 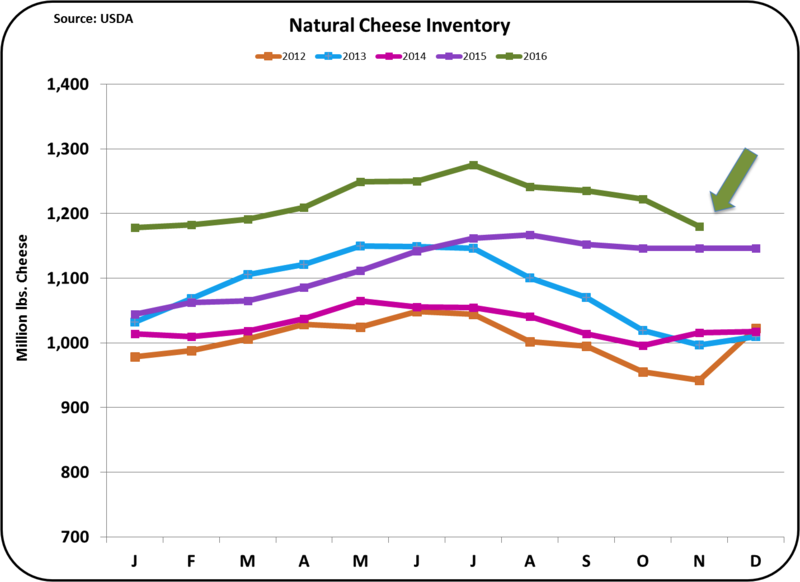 Cheese exports to Mexico and Canada remain stable, but are off for all other countries. 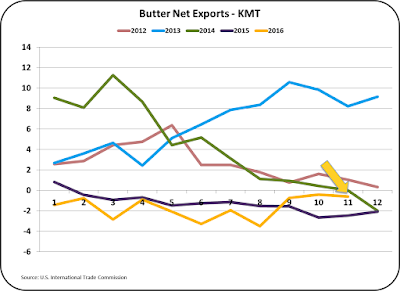 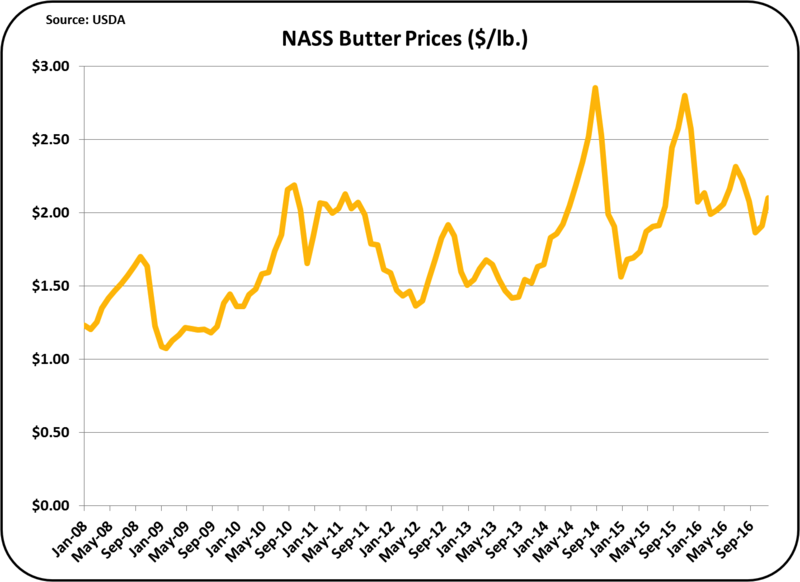 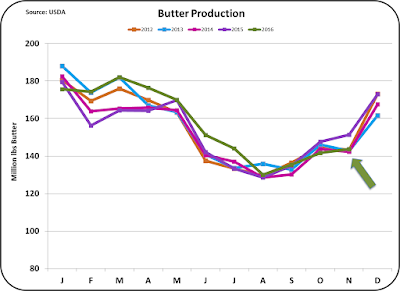 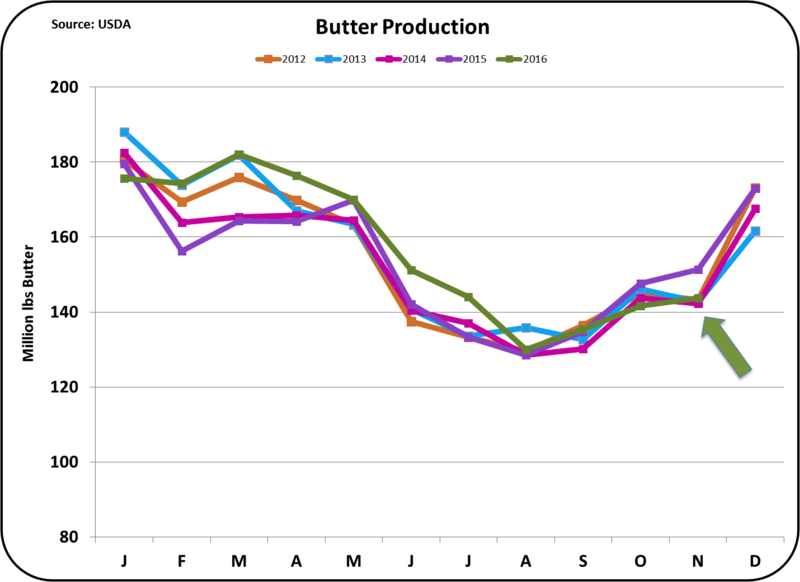 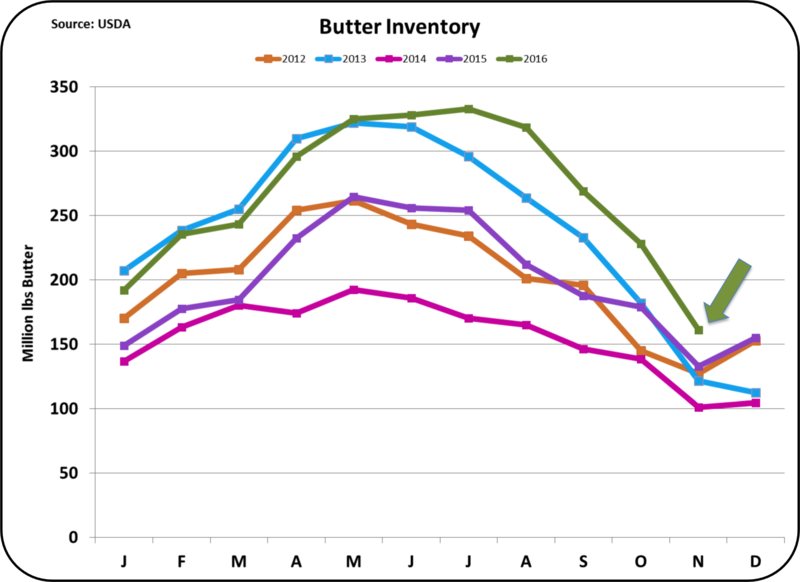 Butter exports remain low due to pricing. 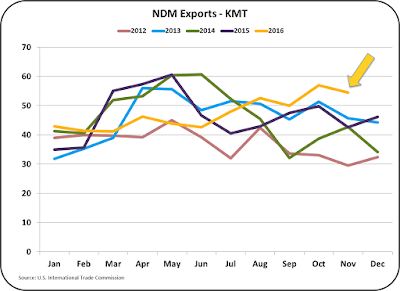 What is exported is mostly going to Mexico and Canada. 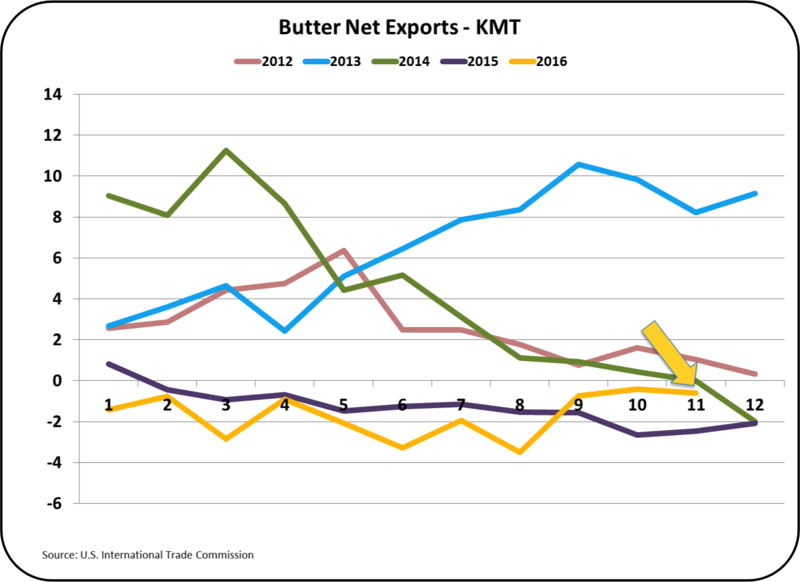 The U.S. continues to import more butter than is exported. 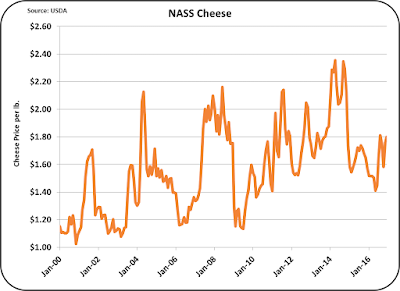 Below are five charts that reinforce the prior post on "Election Impact." 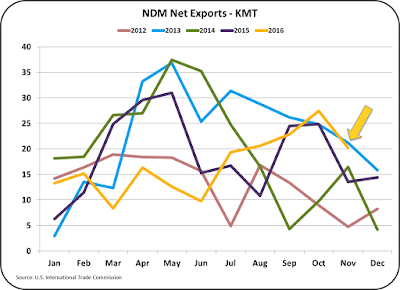 As the USD gets stronger, exports become more difficult and imports are more financially attractive. 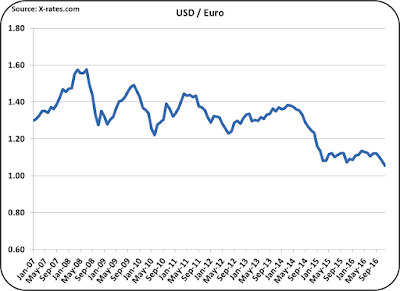 Since the November election, the USD has become increasingly strong. 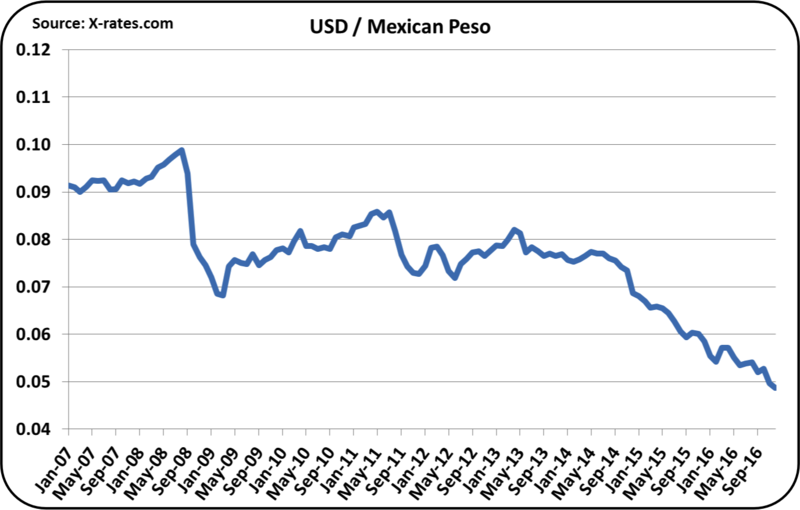 In the charts below, a lower value means a stronger USD. 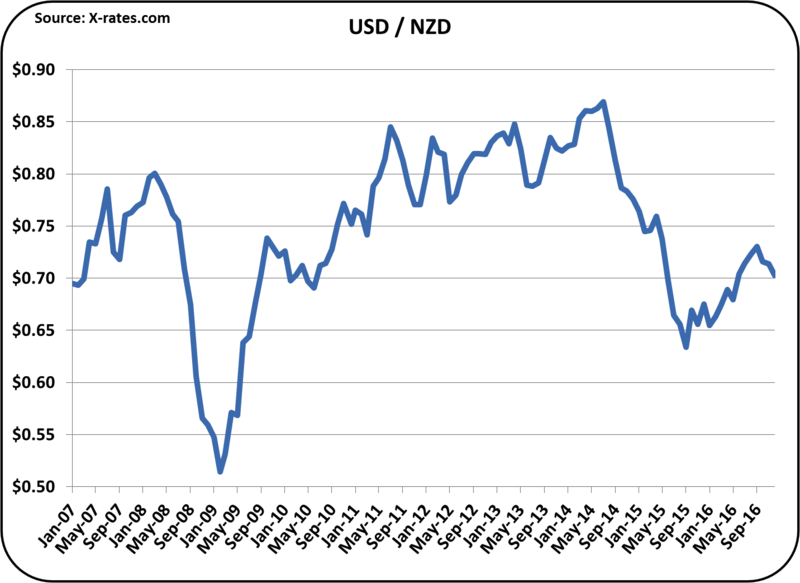 The first two charts show the USD relationships to the currencies of the two strongest global dairy exporters, New Zealand and the EU. 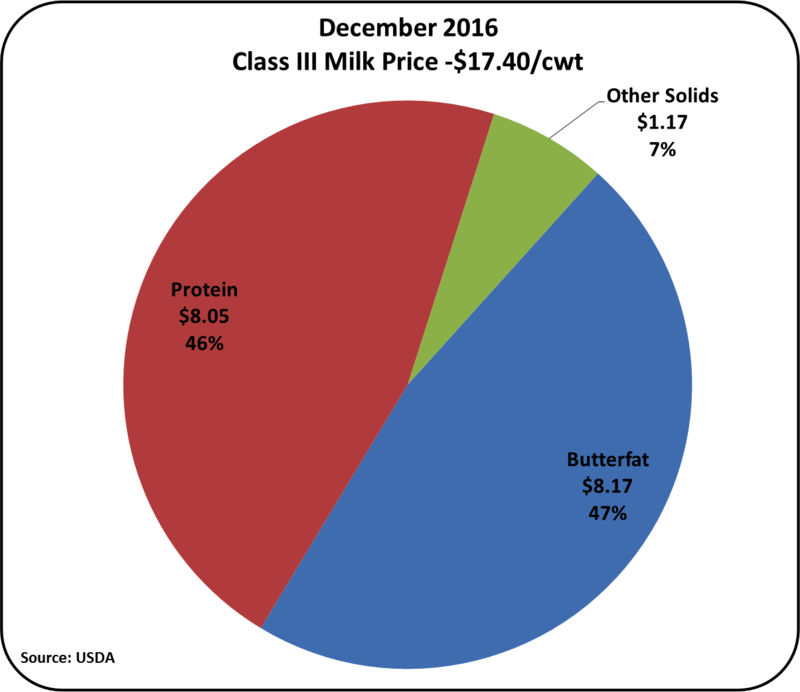 Since November, the USD has made U.S. dairy products less competitive by about 5%. 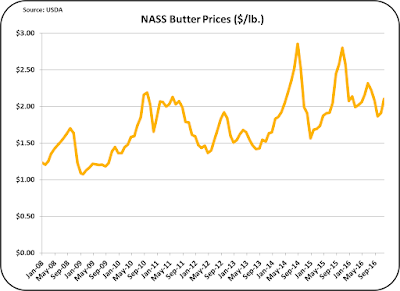 Fortunately, global prices are increasing, but a 5% discount to compensate for exchange rates has taken some of the joy away. 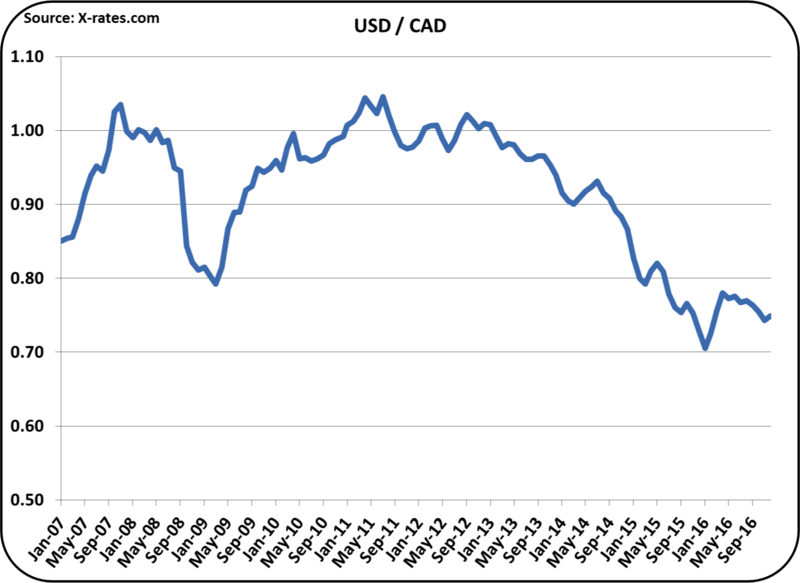 The last two charts on exchange rates show the impact with our two large and long-time trading partners, Mexico and Canada. 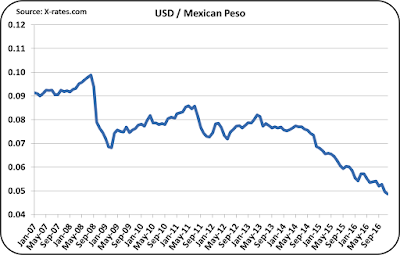 The Mexican Peso has been especially hard hit, and the Canadian Dollar has also taken a plunge. The impact of these exchange rates has not been fully felt in the November data, but will make 2017 net exports more difficult. 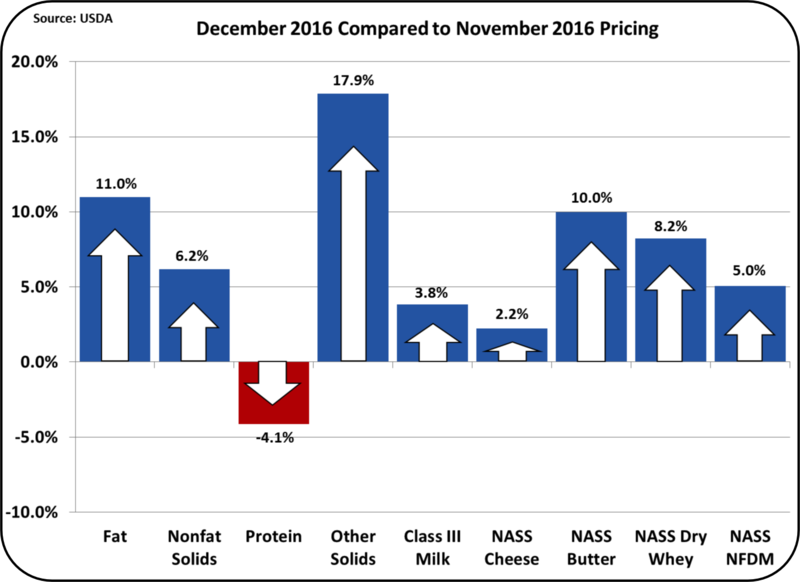 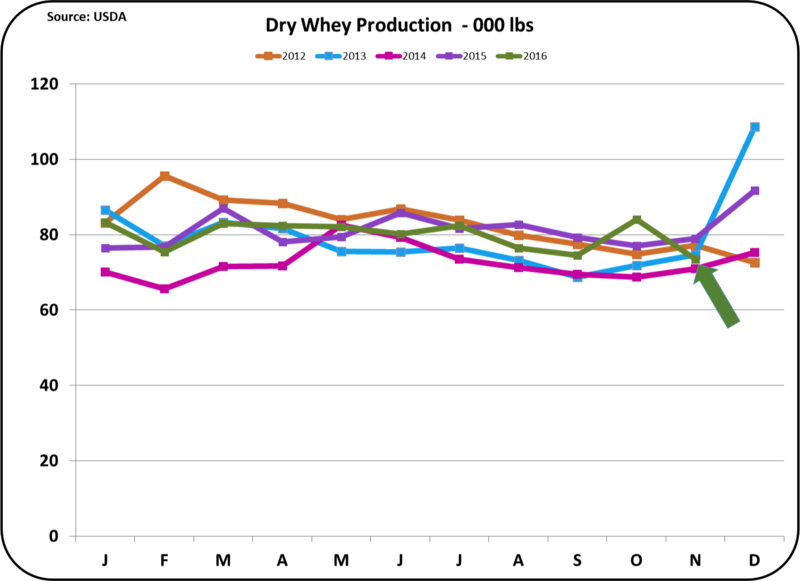 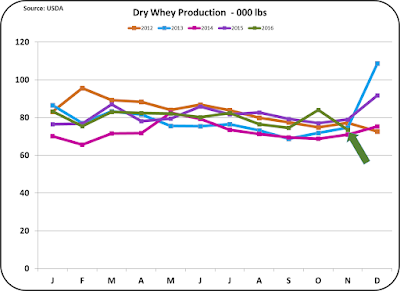 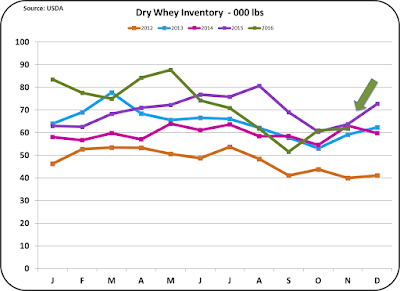 Overall, there are three strong events that will influence dairy prices in 2017. 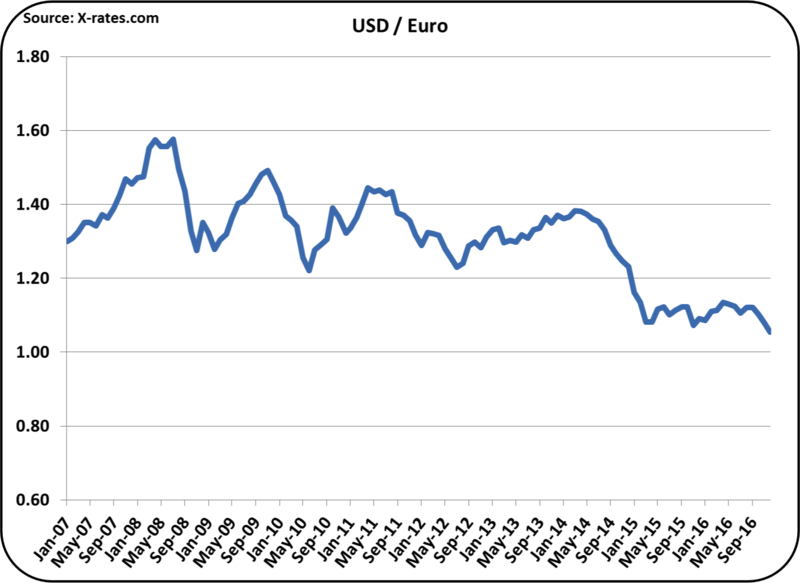 One is the increasingly strong USD. 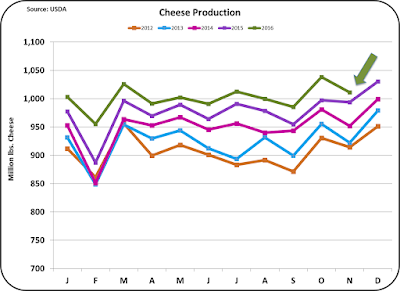 The second one is the reduction in milk production by Europe, New Zealand, and Australia, who are all major players in the international markets. The third event that could impact the U.S. dairy industry is the possible change in California pricing practices as they may transition from their six decade old system of unique pricing, and become a Federal Milk Marketing Order. 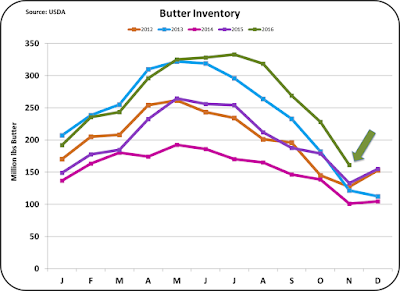 These developing events will be followed closely in this blog.